engine rebuilt in 1999, 1992 PURSUIT center console with 200 HP Yamaha. 21'6" with a beam of 8'6". Comes with dual batteries, both new, Hard T-Top, cockpit lights, console curtains and cover, rocket launchers and leaning post, live well, tackle storage, under console storage, freshwater wash down, bow pulpit. 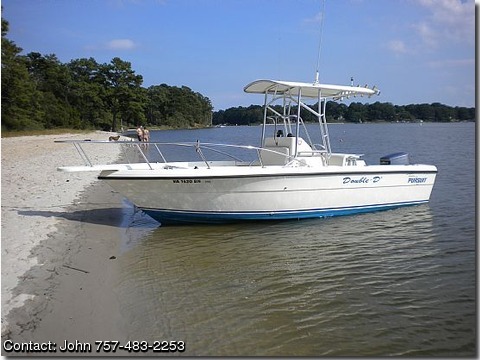 Electronics include Fish Finder, Loran, VHF Marine Radio, Sony FM compact disc player Boat is in great shape, everything works and is ready to fish.